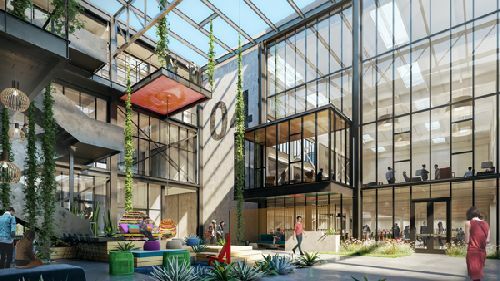 Construction has started on The Press, a reinvention of the former LA Times Orange County printing press warehouse and press room into a reimagined creative work campus and proposed food hall. The 420k sf campus, located at 1375 Sunflower Ave in Costa Mesa, is expected to be ready for delivery to office tenants by the first quarter 2020. The $200 mil-plus project, being developed by SteelWave and global real estate investment manager Invesco Real Estate, will encompass 380.9k sf of creative office space with approximately 51.6k sf of modern retail space. It is located in one of Orange County’s emerging submarkets adjacent to SteelWave’s Hive, which hosts the headquarters and practice facility of the Los Angeles Chargers. Del Amo Construction is the general contractor. Newmark Knight Frank’s Senior Managing Directors Jay Nugent and George Thomson are handling pre-leasing. The Market Hall food hall is being planned in collaboration with renowned LAB Holding. The concept, submitted for review by the City of Costa Mesa, includes a curated roster of over 50 makers and restaurants focused on seasonal local products. When undertaken, this retail/food hall will be LAB Holding’s largest Orange County project. The firm is recognized for construction of The CAMP eco-retail campus in 2002 and its properties within the SoBECA District, the Anaheim Packing District, Center Street Anaheim and the historic Casino in San Clemente. “The Press is a truly one-of-a-kind offering in one of the most exciting areas of Orange County. This property embraces its history but also responds to what today’s modern user desires in office space. We are especially excited about our collaboration with LAB Holding as they have proven to be forward thinking and successful in developing what the market wants. We look forward to bringing The Press back to life,” said Seth Hiromura, Managing Director of SteelWave. The Press is a reinvention of the former LA Times newsroom and print production facility that celebrates the history and character of the industrial space. Defining elements of the original structure such as the canopies and monolithic concrete walls, the steel frames and the machine rooms, will be retained, further reinforcing the site’s history. The Press’ design, created by Ehrlich Yanai Rhee Chaney Architects, embraces natural light and views. Indoor-outdoor relationships are a pervasive component in the space. Loading docks and canopy overhangs become continuous back porches for collaboration and reflection. An open air atrium brings dynamism to the central press line, while a skycut slices across the building to introduce daylight. Landscape ties together the site and structure. The revitalized space is divided into five sections, each with unique industrial details salvaged and restored from the original structure, as well as modern architectural features that highlight the site’s rich history. Additional amenities will include The Eye, a one-acre park with a zen garden, curated art and two open air cafes surrounding a central green for picnicking and weekend lectures, movie nights and markets; WIFI throughout; designated ride share, bike share, and scooter share drop-offs; and more.